A huge hack about face management feature have been processed. Some conditions introducing are now closed. Implementations in shared library libkface dedicated to detect and recognize faces are now more robust and suitable for production. A new overlay have been add to all icon-view to indicate if items has geo-location information. This will help end users to find quickly in album which items use GPS coordinates. Thumbnails now support large resolution monitor. Thumbs size can be expended to 512 instead 256 previously. digiKam 4.1.0 depends on the latest opencv 2.4.9 which is not yet available in Ubuntu repository. Fortunately, a third-party PPA, maintained by Philip Johnsson has built them for Ubuntu 14.04 Trusty LTS. like you, i have been using digikam for five years. I use Digikam 3.5.0 now which crashes often. 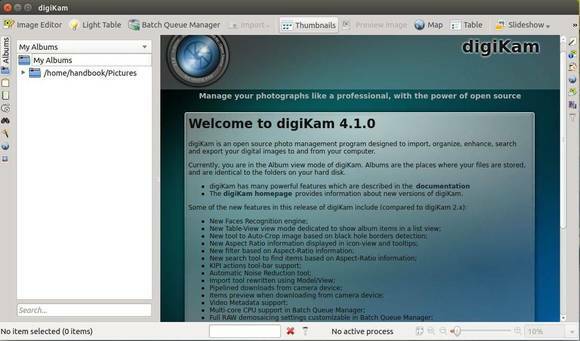 I hvae followed your instructions about install/upgrade to digikam 4.3.0.
what steps to get the 4.3.0 version of digikam. You may first remove digikam 3.5.0.